Welcome back to week 2 of the June Herb Challenge. This week we’re gonna learn a bit more about the herb calendula and get started on another herb project. This weeks challenge will take a bit of time to make, but don’t worry, most of the time involved won’t include you. I’ll explain more below, but you will need this project in the last weeks project so don’t skip it! Okay, so let’s move on to this weeks info on calendula. Last week I talked about how calendula is a great herb for the skin, and we focused on extracting its benefits with oil. This week I wanna talk a bit more about using calendula on the skin, but I also want to introduce taking calendula internally as well as how to extract it’s properties using a different menstrum than oil. Like I said last week, calendula has antiseptic, anti-inflammatory and astringent actions on the body and these actions are great for skin issues, but did you know this amazing herb does even more? Two other actions calendula has is that it helps to relieve muscle spasms and it prevents hemorrhaging. These particular actions are beneficial when calendula is taken internally rather than externally. For example, if a person is struggling with Crohn’s disease or a bad case of diarrhea and is having severe intestinal cramping, calendula is a great herb to try out to see if it will help. Another example is someone who has gastric ulcers that are inflamed. Many times, ulcers can bleed, and boy can they bleed a lot! Not only can calendula slow down that bleeding, but it can help with the pain as well. Now you may be wondering how this works as I said that calendula’s actions on the body are more localized than systemic. Well, this is still true in the examples above. Taking calendula internally doesn’t automatically put it on a systemic level. It’s still acting locally… on the bleeding ulcers or on the smooth muscle of the intestines. An herb that acts systemically is one that affects multiple body systems, not just one. Okay, so at this point, let’s take things one more step forward with this herb, but first, let me ask you a question. Have you ever used an herb before that someone promised you would work for a particular issue, but when you tried it, it didn’t work? That can be really discouraging, especially if you’re really wanting to go with a more natural option for health and healing. Well, if that’s ever happened to you, let me tell you why the herb you used may not have worked. Herbs are not a one-size-fits-all approach. There’s not always one herbal answer for every problem you may experience. In fact, there are usually several. So how do you know which herb is right for your issue? You have to do a bit of research and learn about “herbal energetics” and “tissue constitutions”. Let me explain. When it comes to the examples I mentioned above… you know, the ulcers and the Crohn’s disease, these are tissue constitutions that are excited (ulcers) and constricted (diarrhea). They tend to be hot and very moist which means you need herbs that are the opposite of those conditions… cool and dry, in order to bring balance back to the body. That’s what herbalism is after all… an effort to bring the body back into balance through the actions of various plants. Now in order to balance these two conditions, we need to look into the energetics of the herbs we’re considering using. Calendula just so happens to be a dry, cooling herb so it would be great for either of these conditions. But, if calendula happened to be a hot or moist herb, it wouldn’t be good for these conditions and most likely wouldn’t work. In fact, it may make things worse. All of this is just to say… there’s more to herbs than matching an herb with a problem. Sometimes that works, but it can be very hit and miss. Understanding more of the chemistry behind the herb is really helpful if you wanna get things right the first time around. Okay, so that’s enough info for this week. Let’s move on to our project. Tinctures are probably one of my favorite ways to use herbs. Not only are they concentrated which makes them strong and powerful, but they don’t take large amounts to be effective which is a plus. Another reason I like tinctures so much is that they tend to work quicker than other preparations… as quickly as two weeks where other herbal preparations can take a month or more to start bringing about balance in the body. Again, this isn’t one-size-fits-all. It depends on the herb your using and what you’re using it for. I’m speaking in general terms here, and I’m speaking about alcohol tinctures, not glycerin tinctures. Speaking of alcohol, using alcohol with herbs is one of the best ways to extract certain constituents from the plants. Alcohol does a really good job of getting inside the plant material and drawing the good stuff out. Some of the constituents alcohol is known to extract from plant material are alkaloids, glycosides, flavinoids, saponins, tannins, and resins. When it comes to calendula, alcohol will extract the carotenoids, glycosides, flavinoids, saponins, and resins. 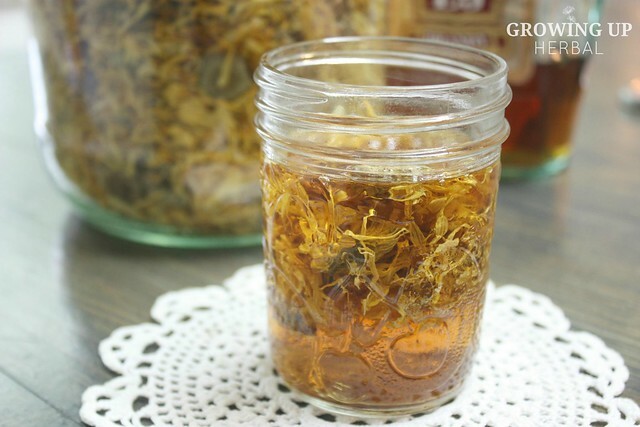 This calendula tincture can be used in a variety of ways. Below I’ve listed several different options you have so you can make the most of this weeks project. Alright, let’s move on to our project. 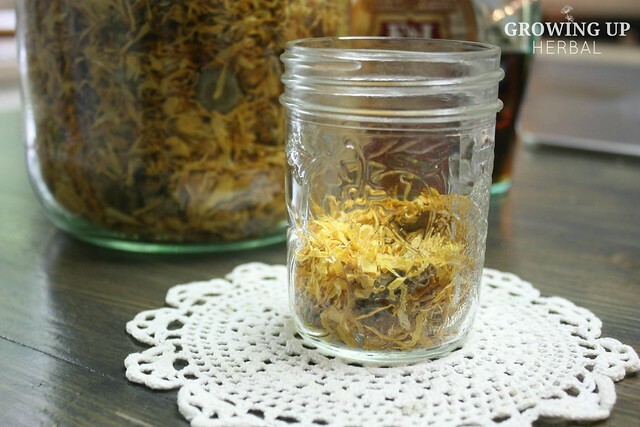 Fill a glass mason jar 1/2 full of dried calendula blossoms, pressed, not packed into the bottom of the jar. Pour alcohol over calendula, filling jar. Stop when alcohol is 1 inch from the very top of the jar. Cut a square of parchment paper. Place this between the jar and the lid and band. This prevents the alcohol from coming in contact with the lid which can lead to lid erosion and chemicals in your tincture. Label your jar with the following and place it in a cool, dark place for 2 weeks. Shake it 1-2 times daily. 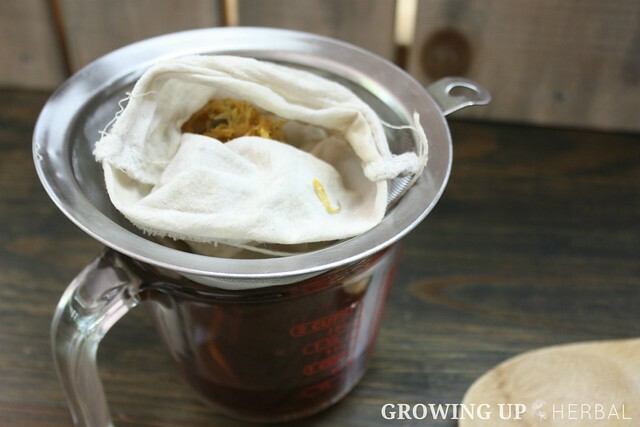 After two weeks, strain tincture through a fine sieve lined with fabric making sure to squeeze as much of the alcohol from the calendula blossoms. Pour strained tincture into your 4 oz. dropper bottle. Label as follows and store. Marilene Richardson of SongCroft Farm suggests testing your calendula tincture for quality by applying one drop of tincture to the surface of a hand-held mirror and waiting until the alcohol dries off. 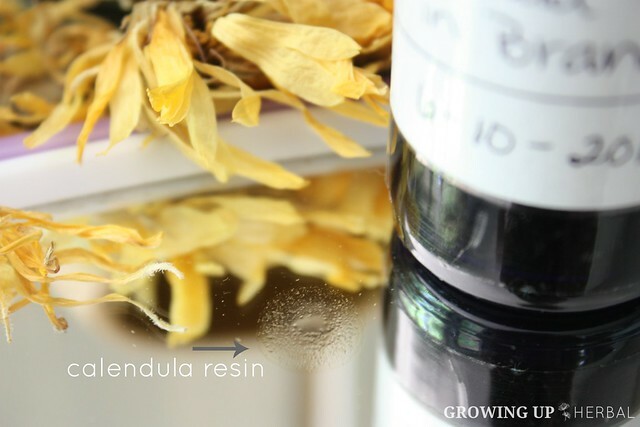 Once dry, there should remain a raised droplet of sticky, golden resin. The recipe below can be used with the calendula tincture from today’s project, and is adapted from one of Rosemary Gladstar’s personal recipes and makes 2 – 4 oz. bottles. This is my go-to recipe for throat infections like strep throat. Enjoy, experiment, and have fun! 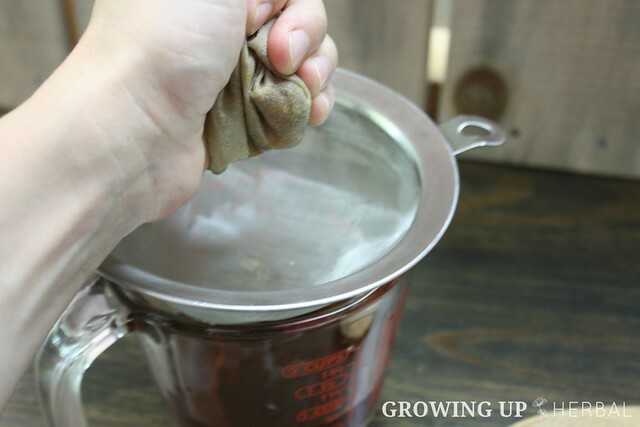 Add echinacea root and sage to boiling water, cover, and let steep for 30-45 minutes. Once cooled, pour into 4 oz. glass spray bottles until the bottle is ¾ full. Add your calendula tincture to fill up the remaining 1/4 of the bottle. Then, add essential oil to each bottle. Okay, so below are questions to answer to see what you remember from the above info. Just like last week, try to answer them without looking back, but if you need to,go for it. Name one of the two new herbal actions of calendula that was mentioned this week? What is one condition/illness/problem that the action you chose would be helpful with? What are the energetics of calendula? What is the goal of herbalism? How long do you need to consistently take a tincture for before expecting to see results? Name one plant constituent that alcohol extracts? Okay… all done! Great job! This was a big week, full of heavy information and a more intense project, so awesome job sticking with it and completing it all. Next week we’ll tackle some more calendula information and we’ll try out a whole new project… all with this wonderful herb! If you’re just coming across this herb challenge and you’d like to participate, CLICK HERE to learn more about the challenge itself, to access the materials list for the challenge projects, and to access each week of the herb challenge. Okay! 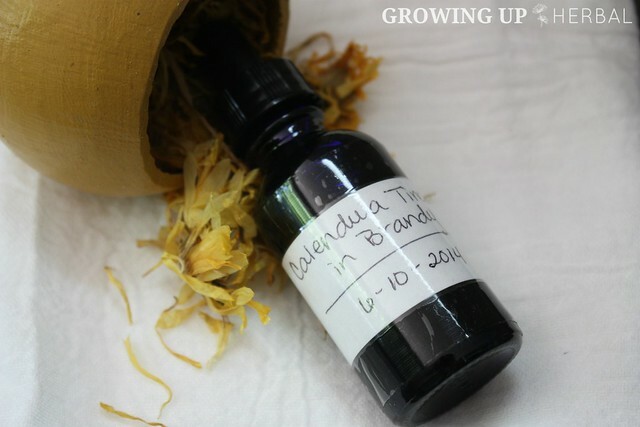 So in the comment section below, tell me one thing you learned about calendula this week. Also share one way you’re planning on using this tincture in your family, and as always, if you have any questions about this weeks lesson, leave them below. I’ll respond to them ASAP! The Green Pharmacy Herbal Handbook by James A. Duke, Ph.D. I didn’t realize tinctures were so useful. That’s really good to know! Does a plastic lid on the tincture keep the erosion away? Also, can I use vodka 80 proof for this recipe instead? I definitely plan on making the triple strength throat spray. I can’t wait to use it to see how good it works for me and my husband. Thanks for the info!! Yes, you can use plastic lids when your tincture is macerating instead of the parchment paper if you want. And yes, 80 proof vodka will work for dried herbs. Not fresh as they contain too much water and need an alcohol with a higher proof. Good luck with your throat spray! I love that stuff! 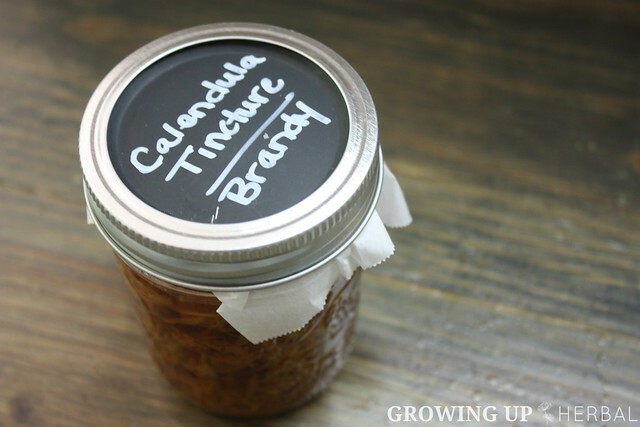 Making tinctures is so easy, but I never thought to make it out of Calendula. I’m excited to use my green tinted jars.. Meagan could I use the white lids that are BPA free? Also, could I use waxpaper instead parchment paper? Definitely, I will make Rosemary Gladstar’s throat spray too. My throat has been acting funny since I’m out and about in the garden. Meanwhile I’m using the Double E tincture…I see it only takes two weeks to do Calendula tincture, is that because of the soft flowers? I love to learn to make soap but just not confidence in doing so..Unless there is an easy way using the Dr, Bronner’s soap? Sorry I haven’t answered of late ,the internet been acting funny and yes we got the thunderstorms too. Yes, Monica. You can use the plastic lids instead of the parchment paper, and wax paper will work as well. You just want a barrier against the metal. As far as tinctures go, you can macerate them for different amounts of time. 2 weeks is typical, but if you have harder herbs like roots and barks, 4-6 weeks is best. Thanks! I was wondering how well do you think the throat spray might work on an ongoing throat irritation. Several weeks ago during a mud run I jumped into a mud pit, and it seems that somehow,(this has never happened to me before jumping into bodies of water) I am thinking that water went up my nose and into my ears at the same time, because right after I could feel more fluid in there that I’ve ever had, in 53 years, my life, and then shortly after that the pain was so great I almost went to the ER for pain meds, finally by the end of the night by using EOs, peroxide, and alcohol, and heat the pain subsided enough for me to sleep, for several days after it felt like the fluid was still there, I still am having some problems with them but I also have had a an irritated, scratchy, sometimes very soar throat, I think using EOs and herbs I’ve kept it from infection, so with that background info do you think that the throat spray might help, based on the energetics of the ingredients or maybe do you have any other ideas that might, it’s starting to me. I’m not really sure Lori. It seems you have a lot going on there. You may be having the sore throat because you have fluid in your sinuses and ears causing post nasal drip… which can irritate the throat. The throat spray could help because the herbs are astrigents and they’re drying. It’s worth a shot! 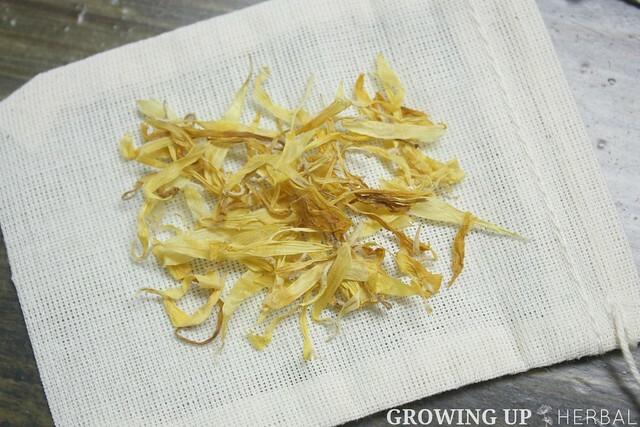 Question: I donot want too get far ahead from our lesson but, what seeds do you use for growing Calendula? I have some started because of our short season where I live.I am using Pacific Beauty, suppose to be an Heirloom seeds. Is this the ones you are growing? We’ll be talking about growing calendula soon, but you need Calendula officialis seed. It’s the medicinal variety. All others are garden varieties, and from my understanding don’t have the therapeutic properties that the medicinal kind has. Okay Meagan i research it further that ‘Pacific Beauty’ is Calendula officinalis. So confusion that it did not say that on the package of seed. Calendula officinalis ‘Pacific Beauty Mixed Colors’ – This is a more heat tolerant variety of the traditional yellow and orange plants. That’s so interesting! Thanks for sharing. I didn’t realize there were different types of the traditional species. I am looking forward to doing this challenge (a little late but better than never, right?)! I was just wondering what proof of alcohol must be used for a tincture? I don’t have any brandy but I do have quite a selection of “pre-baby” alcohol…. 😉 Also, does it matter which variety? i.e. : whiskey, vodka, etc. Thanks for all your info! It makes learning herbs fun and not as overwhelming! So glad you’re joining us Shenna! The alcohol proof should be 80-90 proof for dried herbs… it’s 180 proof for fresh herbs. As far as the kind of alcohol, I don’t think it really matters… really it’s what you prefer as each alcohol gives the finished product a different taste. Vodka is cheaper, but in my opinion, brandy tastes best! Hi, I’m not sure why the Pinterest icon is not working? Looking to Pin for my resources! 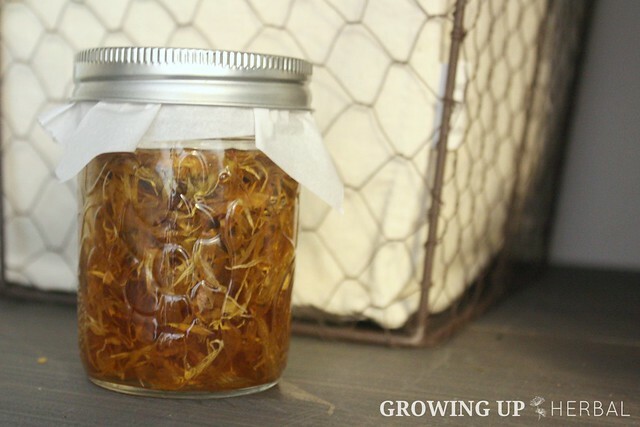 I have a few quarts of Calendula dried from my garden this year. This is my first year growing and preparing to make oil and tinctures. That’s so weird Angela… it’s working on this end. Maybe try refreshing the page or opening it in a different browser. You can also copy the page URL and pin it manually on Pinterest. Just open your Pinterest account, locate the + sign in the bottom right hand corner of the page, and select add from a website (you can also upload it if you want). Follow the directions and that should work. You may have to go back into the pin and edit it to make sure it links back to the page. Sometimes it gets confused and doesn’t do it right. Hope that helps! So sorry for the trouble! What kind of alcohol works for this? like brandy, vodka etc. Also, would wax paper work instead of parchment for the lid covering? I used brandy, Grace, but you can use vodka as well. And yes, wax paper would work, but you can also use a plastic lid if you have them.